FILE - Masked gunmen of the pro-Iranian Shiite Muslim Hezbollah party, clad in military uniforms, are seen in the village of Sohmor, Lebanon. The U.S. Treasury said Mohammad Ibrahim Bazzi was a Hezbollah financier operating through Belgium, Lebanon and Iraq, and was a close associate of Gambia's former president Yahya Jammeh, who is accused of acquiring vast wealth during his decades-long rule. It also imposed sanctions on Hezbollah's representative to Iran, Abdallah Safi Al-Din, who it said served as an interlocutor between Hezbollah and Iran on financial issues. "The savage and depraved acts of one of Hezbollah's most prominent financiers cannot be tolerated," U.S. Treasury Secretary Steven Mnuchin said in a statement. "This administration will expose and disrupt Hezbollah and Iranian terror networks at every turn, including those with ties to the Central Bank of Iran," he said. 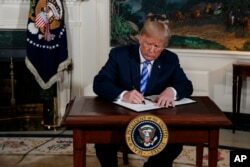 FILE - President Donald Trump signs a Presidential Memorandum on the Iran nuclear deal from the Diplomatic Reception Room of the White House, May 8, 2018. U.S. Secretary of State Mike Pompeo is set to outline in a speech in Washington on Monday plans by the United States to build a coalition to look closer at what it sees as Iran's "destabilizing activities," spokeswoman Heather Nauert told reporters at the State Department. In one of the biggest moves this week aimed at clamping down on Iran's overseas operations, the Treasury sanctioned Iran's central bank governor, Valiollah Seif. On Wednesday, the United States, backed by Gulf States, imposed additional sanctions on Hezbollah's top two leaders, Sayyed Hassan Nasrallah and Naim Qassem.